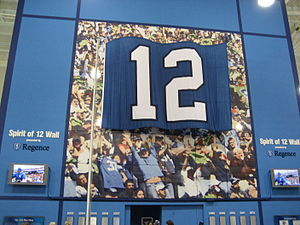 I just recently found out what this means – the 12th man. You see I’m not really a football fan. But I DO live in Seattle – and right now it’s pretty exciting to live here because of our AWESOME Seahawks!! Who knew that they would come from behind and actually WIN! And not just one game – but the one that REALLY mattered! Our pastor played the tape of the legendary run by Lynch – last Sunday and it was really exciting! Many loud fan bring thunderous results – as you no doubt have heard! I have trouble understanding the game. I really have tried – but until this crazy last couple of weeks – I wasn’t interested enough to pay attention – but whether or not I paid attention or was even interested – I AM NOW. And I love how friendly people are in the stores and around town – suddenly everyone is excited about football – and the Seahawks – and we’re smiling and exchanging stories in the grocery line. Good times! I love being the ’12th man’ – it’s very exciting!